A first-year student moves into a residence hall at Oakes College last fall. When fall-quarter classes begin Thursday, October 2, “we expect 4,030 new freshmen on campus, including 3,550 California residents," said Michelle Whittingham, associate vice chancellor of enrollment management. "Also, approximately 1,100 new junior-level transfers will join our community of scholars, with the vast majority (97 percent) coming from California's community colleges.” UC Santa Cruz is expecting approximately 520 new graduate students for the fall term. 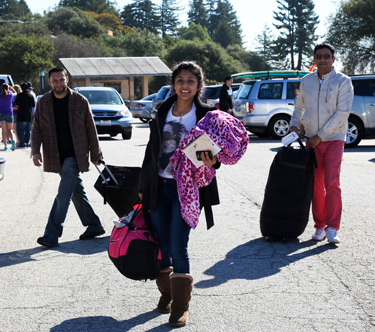 Students, parents, and others can use #ucscmovein to share move-in moments on Instagram, Twitter and Facebook. “Exceptional interest in attending UC Santa Cruz has been evident all year," Whittingham said, "2,000 more admitted students and their families attended our campus spring events, contributing to a higher than expected number of students deciding that UC Santa Cruz was the perfect fit for their educational plans. Not only did we see more California students wanting to enroll, but interest from other states and other countries continues to increase,” she said. "Santa Cruz has always offered a distinctive world-class education, and our students reflect a global population,” Whittingham said. Of the new freshman, 232 will come from 33 countries, and 249 from 37 states. “As a California public institution, we continue to enroll a student body that reflects the state’s ethnic and socioeconomic diversity, but we also want our students to be exposed to different cultures and perspectives, and that’s what out-of-state and international students add,” she said. More than one third of the 2014 freshman class (36.2 percent) will be comprised of students from ethnic backgrounds that have been traditionally underrepresented within the UC system – African-American/Black, American Indian/Alaskan Native, and Hispanic ethnicities. This fall's freshman class includes 31 percent from Hispanic or Latino backgrounds and 32 percent who are Asian American. Approximately 30 percent identify themselves as white/Caucasian. The number of African American freshman is expected to grow to 198 students from 163 last year – 4.9 percent of the total class. Unknown or unspecified ethnicity is 1.7 percent. UC Santa Cruz is now a Hispanic Serving Institution member of the Hispanic Association of Colleges and Universities, with 30 percent of undergraduates identifying as Hispanic or Latino, well above the required 25 percent to qualify. The campus is also dedicated to students with financial need – 46 percent of 2013-14 undergraduates received Pell grants, the federal government's need-based program for low-income undergraduates. The five highest demand majors include: Psychology, Economics, Biology, Computer Science and Computer Engineering. Many students choose to join the UC Santa Cruz community because of the distinctive opportunities to take part in undergraduate research and scholarship; six in 10 students participate in research projects before their graduation, a demonstration of the campus’ strong commitment to transformative undergraduate education. ● 5 percent Arts, with the highest demand major in Film & Digital Media. Numerous services and events are planned to welcome new and returning students and assist in their academic and social transition. Sessions include transfer workshops, college orientation, tours of the library and other campus resources, as well as academic advising. This year will feature a highly visible focus on the UC Santa Cruz Principles of Community: Diverse, Open, Purposeful, Caring, Just, Disciplined and Celebrative. Also, each new student is required to study the dangers of alcoholism and substance abuse, and to learn ways to prevent sexual assault and violence within a college community. UC Santa Cruz is renowned for the outstanding educational experience it provides students. It has earned national distinction as a major research university with a commitment to progressive, bold, and fearless inquiry in teaching and public service that benefits both the individual and the planet. Undergraduates pursue course work in 63 majors in the arts, engineering, humanities, physical and biological sciences, and social sciences. Graduate students work toward master's degrees, doctoral degrees, and graduate certificates in 34 academic fields. UC Santa Cruz will celebrate the 50th year of its founding beginning in January 2015.